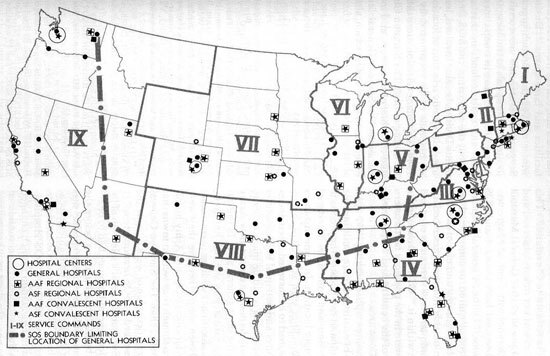 Location of General, Convalescent, and Regional Hospitals in the Zone of Interior during WW2. The Roman figures designate the 9 Service Commands. Many agencies of the War Department were involved in the actions required to provide the US Armed Forces with the necessary ‘Hospitalization and Evacuation’, the War Department General Staff (G-4 Division), the Office of The Surgeon General, the Air Surgeon, the Ground Surgeon, the Surgeons of the different local Service Commands, as well as the Headquarters of the Army Ground Forces (AGF), the Army Service Forces (ASF), the Army Air Forces (AAF) were committed on a large scale. After the outbreak of war in Europe, the US Army increased its authorized peacetime strength, and as Congress approved mobilization, the Armed Forces grew enormously – this affected the Medical Department which had to expand its operations accordingly. 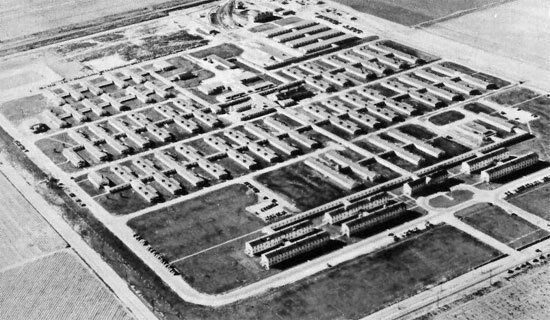 To prepare for a future war, the expansion of medical installations such as overall Hospital facilities in the United States was mandatory, in order to provide the US Army with the necessary housing and number of beds to support a system of field hospitalization and evacuation. New Hospitals were created in the ZI and staffs of existing ones augmented. Green and young inexperienced Officers had to organize hospitals and establish the necessary procedures for their administration. Finally it became necessary to develop new procedures based on the ‘national’ system for the future operation of an appropriate hospital system overseas! This separate article covers the aspect of Military Hospitals active in the Zone of Interior, i.e. the continental United States. It must be noted that almost all the Hospitals were activated in the US prior to their transfer overseas. It is easy to recognize those units that were active in the ZI, for they were ‘named’ Hospitals, whereas the units that were shipped overseas were designated by a number, hence the ‘numbered’ Hospital units. The special ‘affiliation’ or link to Hospitals and Universities sponsoring the organization of Military Hospitals is duly covered in the following paragraphs as well. 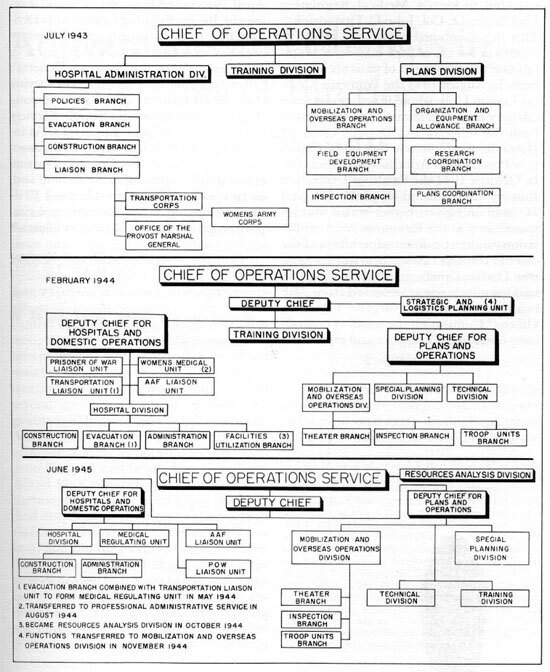 Organization chart of The Surgeon General for Hospitalization and Evacuation, period 1943-45. The top chart illustrates the organization in July 1943, the middle chart shows the organization in February 1944, while the bottom charts depicts the organization in June 1945. In June 1939, the Medical Department had little more than doctrine – only 4 Medical Regiments existed (two of which were stationed overseas) and 1 Medical Squadron, while total Hospital capacity was 4,136 General Hospital beds and 8,234 Station Hospital beds. Limited medical capacities did exist, in the continental United States, in Alaska, in Puerto Rico, and spread overseas in the Philippines, the Hawaiian Islands, and the Panama Canal Zone. The Surgeon General believed the Army’s Hospitals were inadequate, even for peacetime needs, but Congress funds were insufficient to successfully remedy the situation. To at least provide for wartime hospitals, physicians, dentists, and nurses, The Surgeon General proposed to revive the system of ‘affiliated units’ – reserve units sponsored by civilian hospitals and medical schools or universities (as organized by the American Red Cross during WW1). The plan was approved in August 1939 and included proposals to organize affiliated units to staff 32 General, 17 Evacuation, and 13 Surgical Hospitals! The effect of the outbreak of the war in Europe was to expand the US Armed Forces, including the Medical Department. This also involved increased operations and building of new medical facilities, not only in the ZI, but also in overseas possessions, and providing new ones in the Atlantic Defense Bases! The expansion and build-up of hospital facilities in the ZI involved many considerations. Decisions had to be made as to the types of housing to be used and the number of beds that would be required. Means had to be found for providing suitable hospital plants in as short a time as possible. New hospitals had to be manned and the staff of existing ones increased! All hospitals were under technical supervision of The Surgeon General. General view of Lawson General Hospital, at Atlanta, Ga. Designated US Army General Hospital by WD Letter AG 322.3, dated 9 Jan 41. The Hospital was a wooden cantonment-type construction with an authorized bed capacity of 2,514. First patients were received from 22 Jul 41 onward. Medical specialties included neurology, neuro-surgery, amputations, and X-Ray therapy. When President F. D. Roosevelt proclaimed a ‘limited national emergency’ on September 8, 1939, the Medical Department of the United States Army was only operating 7 named General Hospitals and 119 Station Hospitals! Five of the General Hospitals were located in the US (1909 Walter Reed – Washington D.C., 1887 Army-Navy – Hot Springs, Arkansas, 1918 Fitzsimons– Denver, Colorado, 1911 Letterman – San Francisco, California, 1921 William Beaumont– El Paso, Texas), one in Hawaii (1898 Tripler) and another one in the Philippines (1898 Sternberg). The majority of the Station Hospitals was primarily located in the United States and Alaska, with the remainder divided over the Philippines, the Hawaiian Islands, and the Panama Canal Zone. The expansion program on the eve of World War 2 brought along a lot of conflicts, since everybody requested personnel and equipment. When mobilization was announced, planning and expansion of hospitals was made on a more comprehensive basis, and the provision of hospitals in the Zone of Interior became a necessity. Domestic construction of 10 General Hospitals (there were only 5 at the time) was approved on September 25, 1940. Numerous difficulties were encountered in opening new Hospitals, when shortages of suitable supplies and equipment were discovered, thus basic needs had to be met by issuing inadequate reserves stored after World War One. When the Japanese struck Pearl Harbor on December 7, 1941, the Medical Department had a total of 22 General, 24 Station, 17 Evacuation,and 8 Surgical Hospitals that had been activated as training units! Of these, 3 Station Hospitals were already overseas, and 9 Station, 4 Evacuation, and 3 Surgical Hospitals were included in a WD pool with almost 100% of their T/O EM strength, and from 50 to 75% of their Officers’ strength. Affiliated Hospitals organized, but not yet activated numbered 41 General, 11 Evacuation, and 4 Surgical Hospitals. Scene taken in a Convalescent Center somewhere in the ZI in 1944. Sitting at right, talking with the patients is well-known comedian Bob Hope, touring with one of the USO shows. Camp Atterbury CONV HOSP – Ind. Camp Butner CONV HOSP – N.C.
Camp Lockett CONV HOSP – Calif.
Camp Edwards CONV HOSP – Mass. Camp Pickett CONV HOSP – Va.
Camp Upton CONV HOSP – N.Y.
Fort Custer CONV HOSP – Mich.
Fort Logan CONV HOSP – Colo.
Fort Sam Houston CONV HOSP – Tex. Fort Story CONV HOSP – Va.
Madigan CONV HOSP – Wash.
Mitchell CONV HOSP – Calif.
Welch CONV HOSP – Fla.
View of Oliver General Hospital, at Augusta, Ga. Designated US Army General Hospital by WDGO 64, dated 24 Nov 44. The construction was a multi-story permanent brick building, in fact the converted “Forest Hills” Hotel. The Hospital had an authorized bed capacity of 2,240 patients. 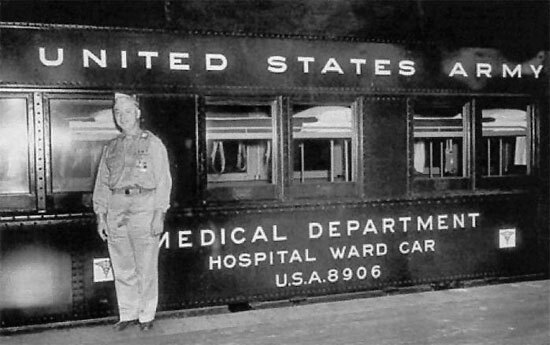 The converted unit was already capable of receiving patients on 28 Jan 43. Apart from general medicine, orthopedic surgery was one the Hospital’s specialties. Evacuation Hospitals were semi-mobile or mobile units designed to provide major medical facilities for treatment of patients received from Division, Corps and Army Clearing Stations. The list below identifies Evacuation Hospitals. The first date following the numbered Evacuation Hospital designates its date of activation, then comes its affiliation, and finally the overseas destination and date of embarkation. Entrance to Ft. Eustis Station Hospital, at Lee Hall, Va. It opened 26 Mar 41 and was commissioned by Col. William Borden. 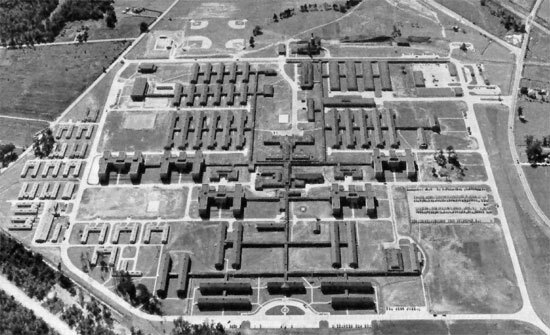 Ft. Eustis was an Antiaircraft Artillery Replacement Training Center (RTC) and had a troop capacity of 815 Officers and 17,266 EM. In Aug 44, the Hospital was considered surplus to requirements by the Army and so was handed over to the Navy for use as a Naval Hospital. Named General Hospitals differed from Station Hospitals, since they were empowered to receive patients from a much wider area and to provide more complex medical or surgical care, particularly in those specialized fields demanding special training and equipment, such as thoracic, neurological, plastic, or orthopedic surgery. Here comes a list of named US Army General Hospitals located in the Zone of Interior during World War 2. The date following the Hospital’s name is the WD designation date, then comes the location, the readiness date, the authorized bed capacity, etc. Aerial view of Birmingham General Hospital, at Van Nuys, Calif. Designated US Army General Hospital by WDGO 48, dated 24 Aug 43. The construction was a “Type-A”, one-story semi-permanent Hospital, built out of brick and stucco, with wards placed on both sides of corridors. Authorized bed capacity was 1,777, and first patients were not received before 25 Feb 44. Medical specialties covered syphilis treatment, rheumatic fever, and psychiatry. Picture of a Hospital Ward Car (part of a Hospital Train) on standby for debarking patients, at Hampton Roads P/E, 29 May 43. After loading, the Hospital Cars would then continue their trip to the Valley Forge General Hospital, located at Phoenixville, Pa. for further medical treatment. 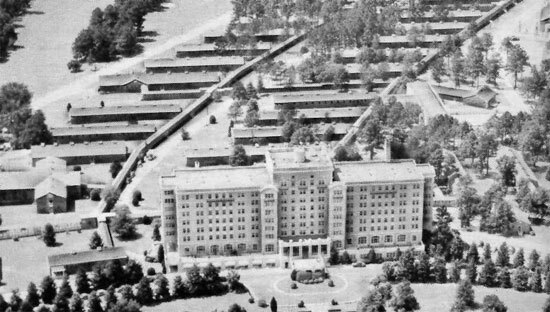 Aerial view of McGuire General Hospital, at Richmond, Va. Designated US Army General Hospital by WDGO 48, dated 24 Nov 43. The Hospital was a “Type-A” construction with additional VA-type brick buildings. Construction was based on Veterans Administration plans for possible use after the war, with approval of The Surgeon General, and with cooperation of the Corps of Engineers (3 similar VA-Hospitals were built during WW2). 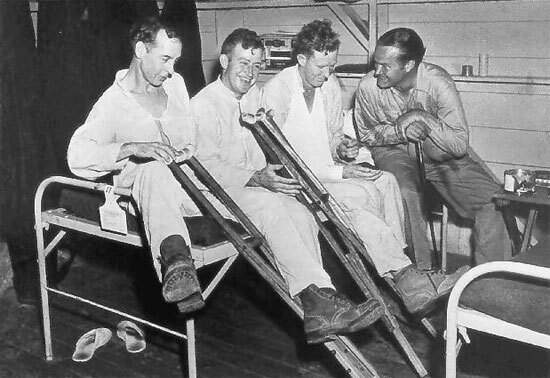 Authorized bed capacity was 1,765, and first patients were received 29 Jul 44. Medical specialties were neurology and neuro-surgery, including amputations. Brooke HOSP CEN – Tex. Camp Butner HOSP CEN – N.C.
Camp Carson HOSP CEN – Colo.
Camp Edwards HOSP CEN – Mass. 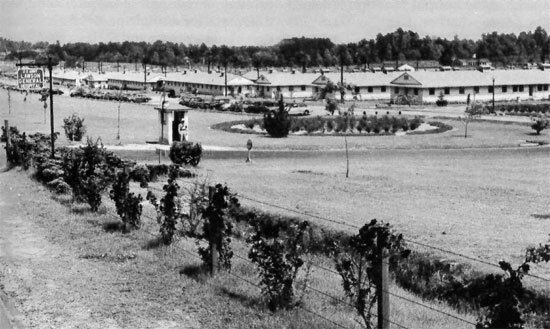 Camp Pickett HOSP CEN – Va.
Madigan HOSP CEN – Wash.
Percy Jones HOSP CEN – Mich.
Prisoner of War No. 2 HOSP CEN – Tenn.
Wakeman HOSP CEN – Ind. 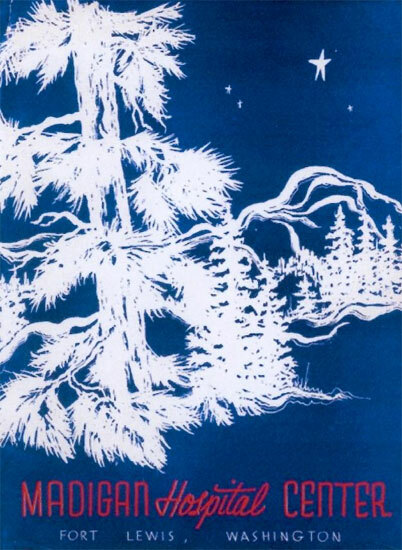 Booklet describing the Madigan Hospital Center, located at Ft. Lewis, Washington, ZI. With Circular No. 115, dated 11 Apr 45, the War Department announced its intention to create 9 Hospital Centers, each composed of a General and a Convalescent Hospital. The new Hosp Cen were to be established at Cp. Pickett, Va. – Cp. Butner, N.C. – Cp. Edwards, Mass. – Cp. Carson, Colo. – Cp. Atterbury, Ind. – Ft. Custer, Mich. – Ft. Sam Houston, Tex. – Cp. Forrest, Tenn. – and Ft. Lewis, Wash. Centralization brought many advantages as well as saving on administration and personnel. Camp Haan REG HOSP – Calif.
Fort George G. Meade REG HOSP – Md. General view showing the 303d Station Hospital, at Cp. Kilmer, Stelton, N.J. The Camp itself served as Staging Area for the New York Port of Embarkation (NY P/E), and had an available troop capacity of 2,074 Officers and 35,386 EM. 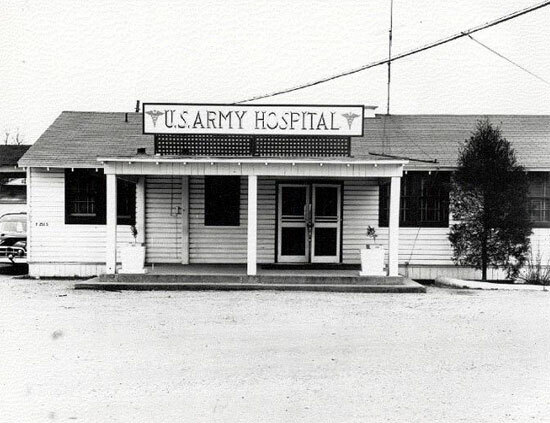 Active Station Hospitals were directed by Army Regulations (AR 40-580 & AR 40-590) to limit themselves in their overall medical practice to serve the local community for relatively minor diseases and injuries. In case more complex medical or surgical care was required, patients were sent to General Hospitals. Camp Beauregard STA HOSP – La. Camp Bowie STA HOSP – Tex. Camp Claiborne STA HOSP – La. Camp Crowder STA HOSP – Mo. Camp Custer STA HOSP – Mich.
Camp Edwards STA HOSP – Mass. Camp Forrest STA HOSP – Tenn.
Camp Kilmer STA HOSP – N.J.
Camp Leonard Wood STA HOSP – Mo. Camp Livingston STA HOSP – La. Camp McCoy STA HOSP – Wis.
Camp Maxey STA HOSP – Tex. Camp Myles Standish STA HOSP – Mass. Camp Ord STA HOSP – Calif.
Camp Patrick Henry STA HOSP – Va.
Camp Roberts STA HOSP – Calif.
Camp Shanks STA HOSP – N.Y.
Camp Wallace STA HOSP – Tex. Charlotte STA HOSP – N.C.
Dante STA HOSP – Calif.
Fort Belvoir STA HOSP – Va.
Fort Benjamin Harrison STA HOSP – Ind. Fort Benning STA HOSP – Ga.
Fort Bliss STA HOSP – Tex. Fort Bragg STA HOSP – N.C.
Fort Devens STA HOSP – Mass. Fort Dix STA HOSP – N.J.
Fort Francis E. Warren STA HOSP – Wyo. Fort Huachuca STA HOSP – Ariz.
Fort Jackson STA HOSP – S.C.
Fort Knox STA HOSP – Ky.
Fort Lewis STA HOSP – Wash.
Fort McClellan STA HOSP – Ala.
Fort Oglethorpe STA HOSP – Tenn.
Fort Rosecrans STA HOSP – Calif.
Fort Sam Houston STA HOSP – Tex. Jefferson Barracks STA HOSP – Mo. Los Angeles STA HOSP – Calif.
New Haven STA HOSP – Conn.
Oakland Area STA HOSP – Calif.
Pasadena Area STA HOSP – Calif.
St. Petersburg STA HOSP – Fla.
Seattle Area STA HOSP – Wash.
Staten Island STA HOSP – N.Y.
Tuskegee STA HOSP – Ala.
Vancouver Barracks STA HOSP – Wash.